In this article, we will talk about the best beach cabana tents you can find on the market. We took into account the products’ price, as well as their quality-to-price ratio. Because of this, we will not mention any extremely expensive brands, such as Sun Smarties or One Step Ahead. Still, you can rest assured knowing that we’ve only reviewed the best beach tent options out there. We have also made sure that all the products included on this list are family-friendly. 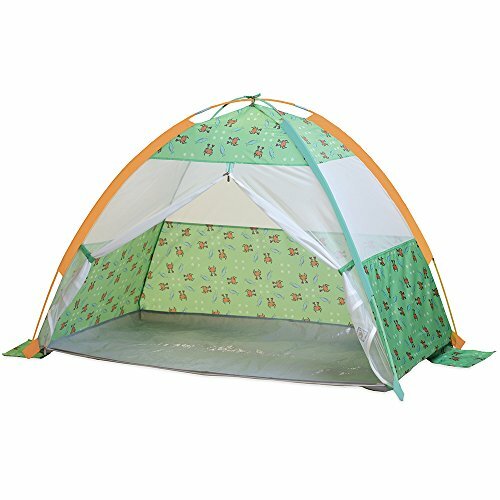 These beach sunshade tents can be used to protect adults and infants alike from the sun’s dangerous rays. 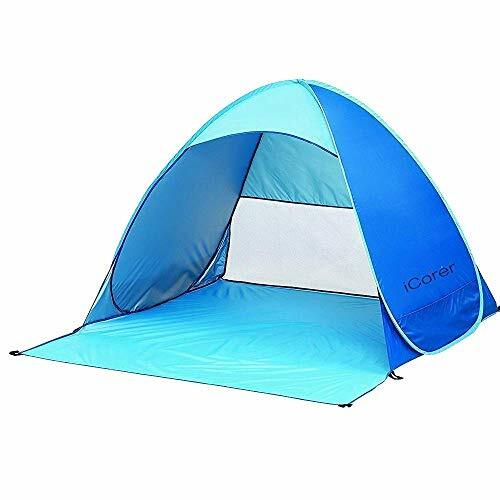 Available in blue and light blue, the iCorer beach cabana tent goes for less than $30. It measures 65 x 59 x 43.5 inches, and it weighs no more than 2.2 pounds. The iCorer tent is made out of dense, double type-B interwoven mesh. Because of this, it benefits from enhanced ventilation and a far more upscale design. Its special fabric is coated in silver, ensuring that no harmful UV rays will ruin your beach day. An innovative patented pop-up design makes it so that the tent requires no assembly. You can easily set it up and take it down in just seconds. It’s just as easy to use in a park, in your backyard, or at a sporting event, as it is at the beach. 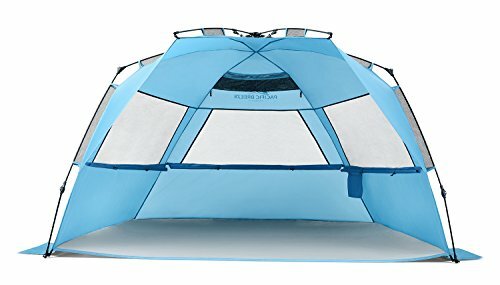 Currently at a discount on Amazon, this Pacific Play Tents entry comes in two color schemes – Seaside and Under the Sea. The beach cabana tent measures 60 x 35 x 40 inches and weighs about three pounds. Very durable, the tent is treated for UV radiation, and is made out of 190T taffeta polyester fabric. This gives it a waterproof floor. 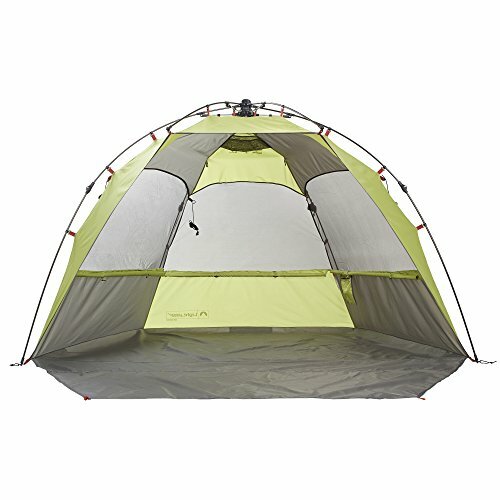 This tent has two inside pockets where you can store essentials, and is very easy to set up and take down. It comes with shock-corded fiberglass poles, a carry bag, and corner sandbags to increase its stability. Thanks to its mesh door full zipper closure, it can keep you safe from insects, as well as from the sun. The first Lightspeed Outdoors entry on this list is usually available for less than $70 on Amazon. It comes in two colors – green and blue. Slightly bigger than our previous entries for best beach tent, this beach cabana tent weighs 4.2 pounds and measures 79 x 57 x 45 inches. With a UPF of 50+, this tent offers all-day protection. It is also usable in a wide array of locations, from beaches to parks and festivals. The cabana tent comes with a carrying case, a shoulder strap, sand pockets, and guy lines and stakes for extra stability. It has three zippered windows designed for maximum ventilation and privacy, and it fits two adults and a child, plus gear. Blue and made out of polyester, this beach cabana tent is one of the biggest on this list. Usually going for around $100, this Lightspeed Outdoors product weighs seven pounds and measures some 108 x 56 x 58 inches. It only comes in one color, blue, and it’s big enough to fit regular-sized camp chairs and beach gear. Able to open and close in just seconds, the tent offers a 360-degree view from its windows. It is perfect for beach use, picnics, camping, backyard, and camping events. This cool cabana tent comes with a carrying case, a shoulder strap, stakes and guy lines, and sand pockets. It also has a UPF of 50+. Available in green and gray, this pop up beach cabana tent typically goes for less than $80 on Amazon. The Sun Shelter measures 95 x 59 x 54 inches and weighs around eight pounds. It also benefits from the innovative Lightspeed Outdoors Side Pull Hub System, which makes it very easy to set up. It’s just as easy to take down as well. Coming with a UPF factor of 50, the beach cabana tent also includes sand pockets, guy lines, stakes, and a carrying case. It also comes with a special extended porch, which can be easily closed for privacy. According to its designers, who are specialized in beach cabana tents, it’s the easiest tent on the market to set up. Going for less than $100, this lightweight beach cabana tent comes with an umbrella-style pole and hub system. This makes it as easy to set up as an umbrella. 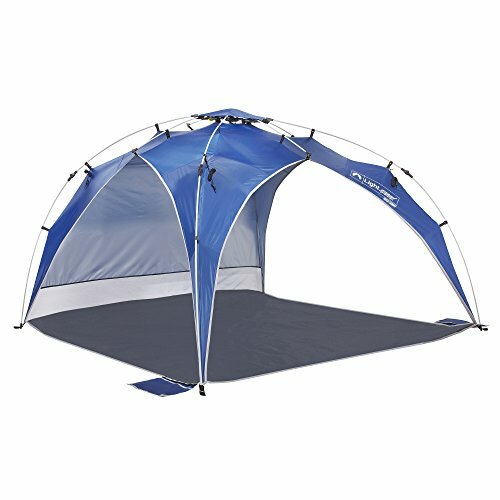 Only available in blue, this canopy tent measures 95 x 59 x 59 inches and weighs seven pounds. 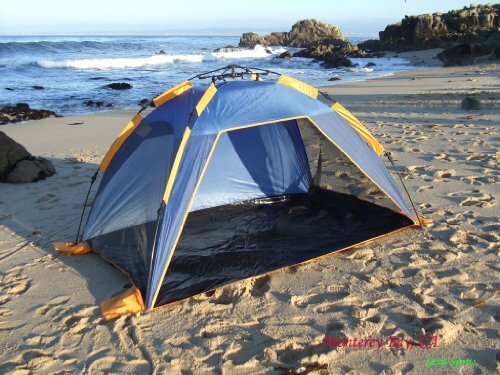 It is the best beach tent for any sort of outdoor activity, be it a festival or a simple beach outing. It comes with sand pockets, stakes, guy lines, a carrying case, and a shoulder strap. The tent also benefits from a built-in side wall reinforced for extra protection. It is large enough to hold a family of four, as well as plenty of gear. Of course, it benefits for a UPF of 50+. The last Lightspeed Outdoors product on our list can be bought for less than $70. It is available in one color schemes – blue and gray. Very compact and lightweight, it weighs six pounds and measures 96 x 54.5 x 49.25 inches. The whole tent is made out of very resilient polyester. It benefits from a UPF of 50+, and it can easily fit two adults, two kids, and all their gear. Of course, the product comes with guy lines, sand pockets, stakes, a shoulder strap, and a carrying case. Its three roll-up windows make for increased ventilation and privacy. One of the most expensive products on our list, this third best beach tent is currently about $100 on Amazon. This is one of the largest best beach tent options that we are going to talk about, measuring 95 x 52 x 51 inches. However, it weighs no more than six pounds. Only coming in blue, this beach cabana tent is fully water-repellent. Benefitting from the EasyUp Hub System, this is one of the quickest tents to set up and take down. With an UPF of 50+, this beach cabana tent has three large windows perfectly designed for ventilation. Fitted with internal pockets and hanging hooks, the tent also comes with five sand pockets and a carrying case. Its frame is made from durable and lightweight fiberglass. 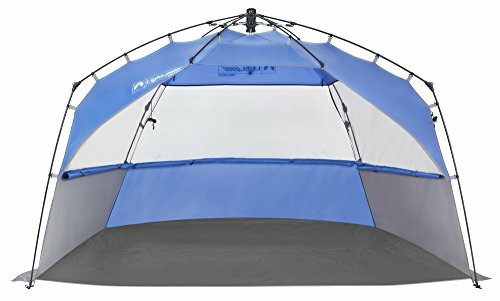 Basically the same type of product as the last one, this number two best beach tent from Pacific Breeze is smaller and cheaper. 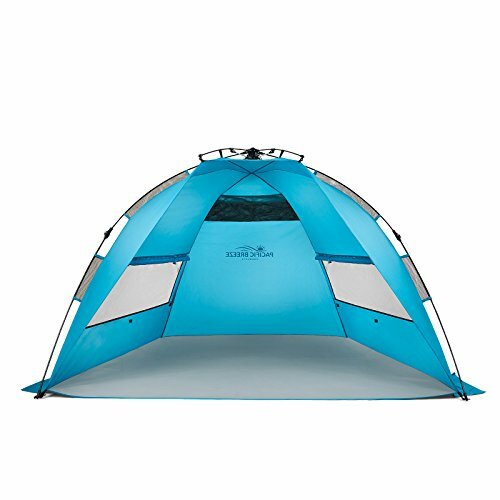 Being available just in blue, the tent measures 87 x 47 x 49 inches and weighs 4.5 pounds. Built with a water-resistant polyethylene floor, it ideal to use in any outdoorsy context. It has an UPF of 50+ and comes with a carrying case, stakes, and sand pockets. It also comes with a one-year warranty. Its three large windows are designed to protect from both UV rays and mild weather conditions. While it is highly repellent, the polyester from which the tent is made is also very breathable. 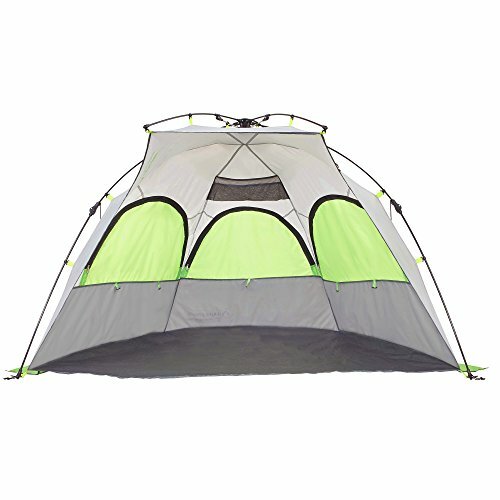 The best beach tent on this list comes from Genji Sports, and it features many positive customer reviews and ratings. The tent is made of nylon, it comes in one piece, and it sports a fiberglass frame that is quite strong and durable. It is easy to set up and fold back down, taking only seconds. The tent is coated in UV 50+ and it is certified by the CPAI-84 flame resistance standard. It only weighs 4.8 pounds and measures 86 x 59 x 43 inches. Upon ordering it, you will also get the stakes needed to anchor it, as well as a carrying bag. It’s difficult to find the best beach tent if you’re not that big of a fan of camping. We stand by our list, as we’re confident that it will be of assistance. If you have any other suggestions for best beach tent options, please comment in the section below. We’d love to hear from you! My experience with tents is you get what you pay for. When it comes to the best tents, the word flimsy excludes it from my list. I don’t care if the tent is just for a day at the beach or a weekend with the family. Flimsy does not cut it when you’re talking about your comfort. Sometimes you go on a review site and every review is glowing, making you wonder how accurate and thorough the reviews are. I don’t see this as a problem at TodayBest. Your site looks through a number of items to find the top ten best (sometimes 11). However as here, even the 10 best beach tents aren’t perfect and you mention the pros and cons. I was giving the Pacific Breeze Products tent a close look but decided against it once you mentioned how it gets hot if it’s out in the sun too long. That’s a deal-breaker for me. Thank you for your comment! We always strive to provide our readers with well-researched, objective reviews, and this includes mentioning both the pros and cons of the products we review. I’m not particularly picky about beach tents. 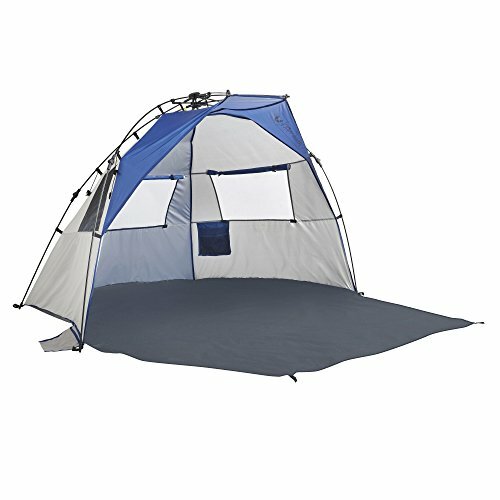 Like anyone, I want the best beach tent out there for the money, but I don’t expect it to be as sturdy as a camping tent. I want it to protect me and my family from the sun and be able to take a little wind. Lots of ones on your list that will meet my needs. Thanks TodayBest!